Lay-flat discharge hose is measured like most other industrial rubber and plastic hoses, by it’s inside diameter. Lay-flat hose differs however by its capability to flatten when at rest or coiled tightly. Often times, we receive requests for odd hose sizes because an end user is measuring the hose at rest, across its width. When a flat hose is opened fully, the diameter becomes smaller. The appropriate way to measure the hose would be across the interior while in the fully open position. Whether the end of the assembly is not accessible or you can only easily access the flat side measurement of a coil, we have you covered. The chart below shows the measurements of our PVC discharge hose across the width (in a flat position), along with their corresponding inside diameters. This information would also apply for rubber discharge hose (soft-wall, or without wire) but may vary based on the wall thickness and its capability to sit completely flat. The dimensions posted are for general reference and may have been rounded slightly. 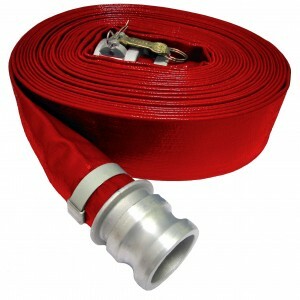 For exact dimensions on a specific hose please feel free to contact us, we are glad to assist.